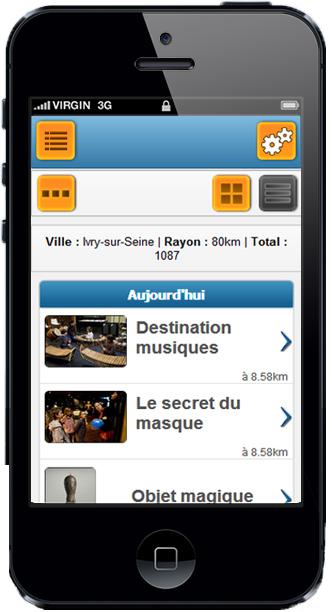 A new mobile version of ExitToLive is in progress and will be published soon. Here is an overview of the next interface. ExitToLive is a service organization of the event-driven and friendlies. This entry was posted in Mobile applications and tagged event, friend, friendly, friendship, make friends, outing on 07/01/2013 by kSaMi. 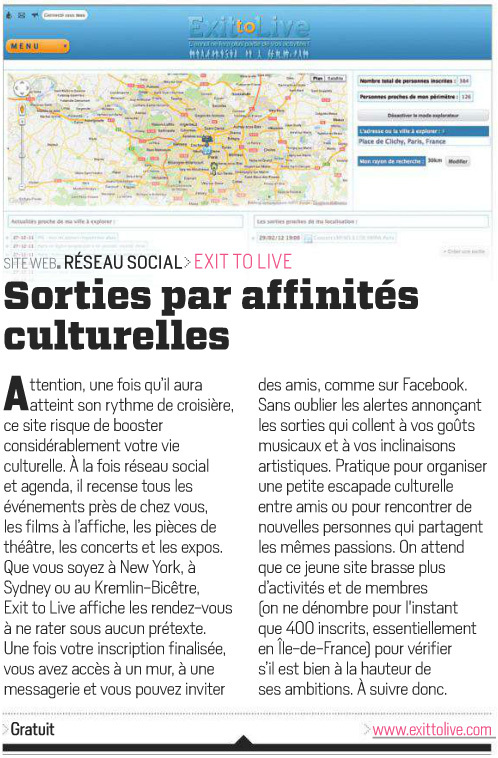 An excellent article was written by the editor of Le Parisien on September 30 (2012) about ExitToLive and its founder. The page that contains all press articles. 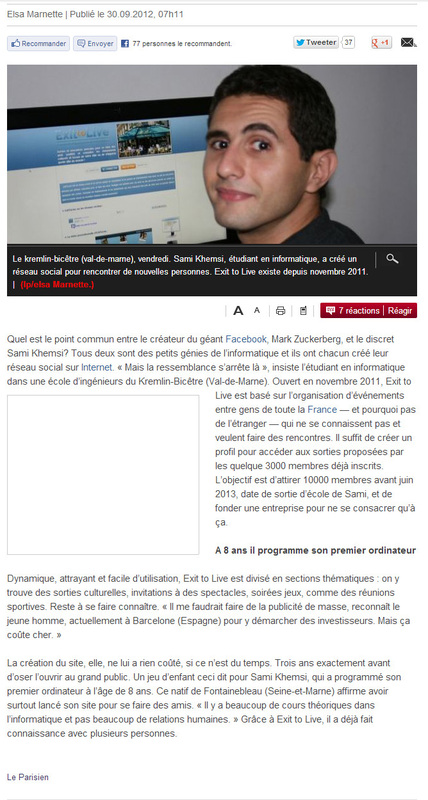 This entry was posted in Uncategorized and tagged friendly, journalist, make friends, press, trip on 02/12/2012 by kSaMi. A new outing has been created by a member of ExitToLive: a Rambling moutain and biking Photographies at Chinon (France) trip. This entry was posted in Outings and tagged friendly, friendship, make friends, outing, press, trip on 14/09/2012 by kSaMi. We are back on ExitToLive ! 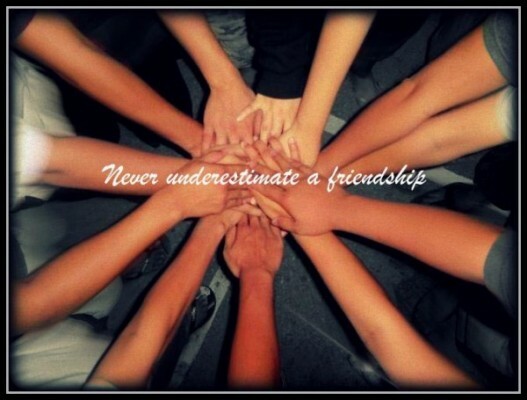 This webservice is designed to forge new friendships and make friends with people who share our same interests. Simply register for free and voila ! This entry was posted in Web and tagged circle, friend, friendly, friendship, make friends, outing on 12/09/2012 by kSaMi. We need more members currently on ExitToLive. We counting on you to inform as many people around you, your friends, your colleagues so that the service starts. Just share this article on Twitter, Facebook or LinkedIn ! This entry was posted in Web and tagged circle, friend, friendly, friendship, make friends, outing, trip on 05/08/2012 by kSaMi. Discover all the press articles about ExitToLive website for organizing friendly trips and making new friends. By sharing the same activity, meet other people who share the same interests as you ! This entry was posted in Press and tagged friend, friendly, friendship, make friends, outing, press, trip on 03/08/2012 by kSaMi. How to create or join trips (outing) on ExitToLive ? Simply register on ExitToLive website and create or join an existing outing. ExitToLive will help you to increase your friend circles ! This entry was posted in Web and tagged circle, friend, friendly, outing, trip on 31/07/2012 by kSaMi.